Citation Information: J Clin Invest. 2006;116(5):1284-1291. https://doi.org/10.1172/JCI27100. Caveolae in endothelial cells have been implicated as plasma membrane microdomains that sense or transduce hemodynamic changes into biochemical signals that regulate vascular function. 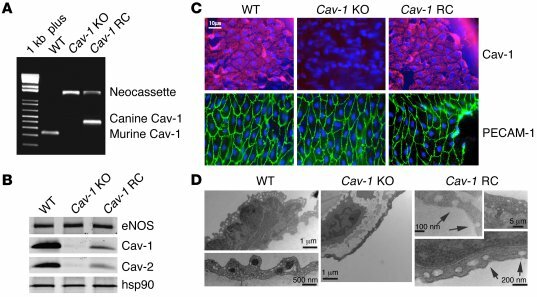 Therefore we compared long- and short-term flow-mediated mechanotransduction in vessels from WT mice, caveolin-1 knockout (Cav-1 KO) mice, and Cav-1 KO mice reconstituted with a transgene expressing Cav-1 specifically in endothelial cells (Cav-1 RC mice). Arterial remodeling during chronic changes in flow and shear stress were initially examined in these mice. Ligation of the left external carotid for 14 days to lower blood flow in the common carotid artery reduced the lumen diameter of carotid arteries from WT and Cav-1 RC mice. In Cav-1 KO mice, the decrease in blood flow did not reduce the lumen diameter but paradoxically increased wall thickness and cellular proliferation. In addition, in isolated pressurized carotid arteries, flow-mediated dilation was markedly reduced in Cav-1 KO arteries compared with those of WT mice. This impairment in response to flow was rescued by reconstituting Cav-1 into the endothelium. In conclusion, these results showed that endothelial Cav-1 and caveolae are necessary for both rapid and long-term mechanotransduction in intact blood vessels. Characterization of carotid arteries from WT, Cav-1 KO, and Cav-1 RC mice. (A) PCR genotyping from genomic DNA extracted from tails of WT (lower band, endogenous murine Cav-1), Cav-1 KO (upper band, neomycine cassette), and Cav-1 RC mice (middle band, canine Cav-1 transgene). 1 kb plus, DNA Mw ladder. (B) Protein levels of eNOS, Cav-1, and Cav-2 in 4 pooled carotid arteries. hsp90 was used as a loading control. (C) In situ whole-mount immunostaining performed in WT, Cav-1 KO, and Cav-1 RC carotid arteries showed expression of Cav-1 protein (red) and endothelial cell marker PECAM-1 protein (green). (D) Representative transmission electron micrographs performed in carotid arteries from WT, Cav-1 KO, and Cav-1 RC mice. Arrows indicate the presence of caveolae. C and D are representative of 4 experiments.